I. L'éclair illuminait le ciel . 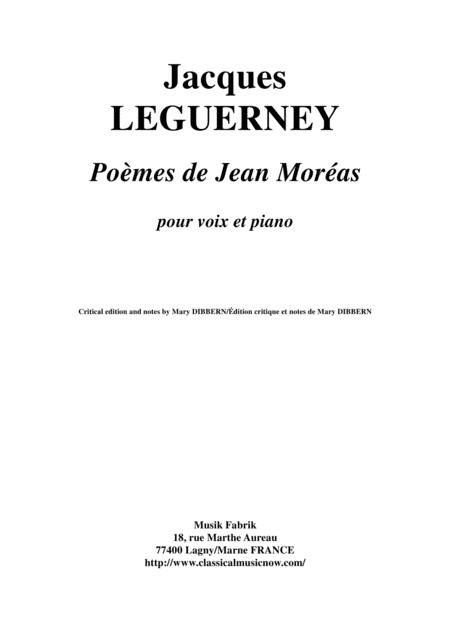 Poèmes de Jean Moréas pour voix et piano (Poems of Jean Moréas for voice and piano) by Jacques Leguerney were composed in 1943. Their first public performance was by French soprano Ginette Guillamat and pianist Thérèse Cochet at the Salle Chopin-Pleyel in Paris on 22 February 1944. This performance also included Leguerney’s Dix Poèmes de Paul-Jean Toulet (Ten Poems of Paul-Jean Toulet ). In 1956, Guillamat also sang Leguerney’s song, Je me lamente, for a radio program on Paris-Inter, accompanied by the pianist Monique Matagne. Thérèse Cochet was the wife of the famous violinist, Pierre Doukan. Ginette Guillamat, (b. 1911) is, at the present time, one of the oldest living French citizens! She was the daughter of the famous bass-baritone, Paul Guillamat and received prizes at theParis Conservatory in both piano and voice. She studied singing with Paul Lhérie, the creator of the role of Don José in Bizet’s Carmen. Guillamat had a distinguished concert and operatic career throughout Europe. Her most famous roles included Micaëla in Carmen and Mélisande in Debussy’s Pelléas et Mélisande. At the close of her long career, Ginette Guillamat taught singing at theConservatoire de Neuilly (near Paris) and, as late as 1993, she continued to teach at her home in Paris. 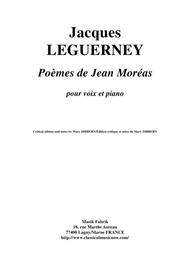 For this edition of the Poèmes de Jean Moréas, all items in brackets are editorial suggestions, and all of the phrasing marks have been added by the editor. The cross-staffing found in the autograph manuscript has been modified for ease of reading. Accidentals that Leguerney repeated in the same measure have been eliminated. 1. L'éclair illuminait le ciel . . .
m 34 One measure of piano before re-entry of the voice ("Et dans mon coeur") was marked out in ms.
m. 59. JL changed "sa" in original poem to "la." m. 60 JL changed "Parque infidèle" to "Parque fidèle." 2. Je songe . . . The “sleep scene” in Leguerney’s ballet Endymion (1950) reuses this music. 3. Il est doux d'écouter . . .
m. 33-35. An ossia written in pencil is in the autograph ms.